David Ortiz did not have history in mind when he stepped to the plate with the bases loaded in the fourth inning last night. His objective was simply to drive in a few runs and help the Red Sox add to their lead. Kansas City pitcher Bruce Chen made that task easier, falling behind Ortiz before leaving a slider high in the strike zone, right over the middle of the plate. Ortiz swung hard and sent the ball soaring to right field, high enough for the crowd of 38,329 to rise from their seats and follow its flight. Did he know it was home run when he hit it? “Come on!’’ Ortiz said, laughing at the notion that it might have been caught. The ball cleared the visitor’s bullpen and landed in the bleachers. The grand slam helped send the Red Sox to a 12-5 victory and added to Ortiz’s growing legacy. The four RBIs gave him 1,000 as a member of the Red Sox. The only other members of that select group are Carl Yastrzemski (1,844), Ted Williams (1,839), Jim Rice (1,451), Dwight Evans (1,346), and Bobby Doerr (1,247). All but Evans are Hall of Famers and have had their numbers retired. He has done better than that. Ortiz has 369 home runs in his career, tying Ralph Kiner for 70th place in history. He also has hit at least 20 home runs for 10 years in a row. “It’s unbelievable what he has done,’’ teammate Adrian Gonzalez said. Of more immediate importance is that Ortiz is 5 for 9 with four extra-base hits and nine RBIs in the last two games. He had fallen into a long slump, hitting just over .200 with only two home runs over a span of nearly seven weeks. A designated hitter, Ortiz lost at-bats during a stretch of nine consecutive interleague road games. Then came the All-Star break followed by his serving a three-game suspension for his role in a brawl with the Orioles. But this homestand has allowed Ortiz to regain the rhythm and timing of his swing. As Ortiz connects, the Sox follow. They have scored 25 runs on 32 hits in the last two games. The Sox have won six of their last seven and now lead the Yankees by three games in the American League East. The series ends his afternoon with Josh Beckett on the mound against Luke Hochevar. Chen (5-4) gave up 10 runs on 10 hits over four innings. The Sox, down, 3-0, in the first inning, scored twice in the bottom of the first, three times in the second, then added five more in the fourth. Gonzalez, who like Ortiz had fallen into a bit of a funk that he now is emerging from, had three more hits and three RBIs. Dustin Pedroia was 3 for 4 with a home run and two RBIs. That extended his hit streak to 24 games. It’s the longest streak in the American League this season and second only to the 30-gamer that Andre Ethier of the Dodgers had earlier this year. He is Pedroia’s former teammate at Arizona State and a close friend. More impressive, perhaps, is that Pedroia has reached base safely in 36 consecutive games with a hit in 35 of those contests. He is hitting .391 during that stretch. Jacoby Ellsbury also was 3 for 4 with a home run. He has 17 this season, tied with Gonzalez for the second-most on the team behind Ortiz’s 20. Eight of Ellsbury’s home runs have come since July 6. Ellsbury and Pedroia had their home runs back-to-back in the bottom of the first inning. According to home run historian David Vincent, the last time the first two Red Sox batters in a game hit home runs was July 21, 1995, when Troy O’Leary and John Valentin did it against Minnesota. 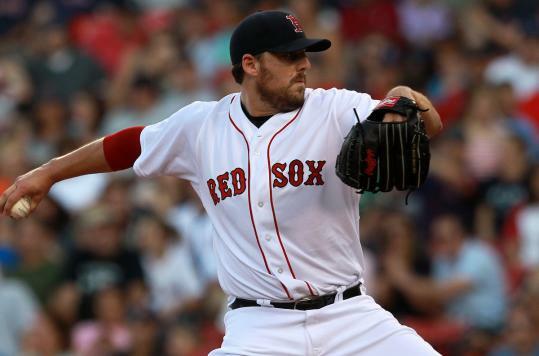 John Lackey (9-8) embraced the run support, picking up his fourth consecutive victory despite giving up four runs (three earned) on 11 hits over 5 2/3 innings.